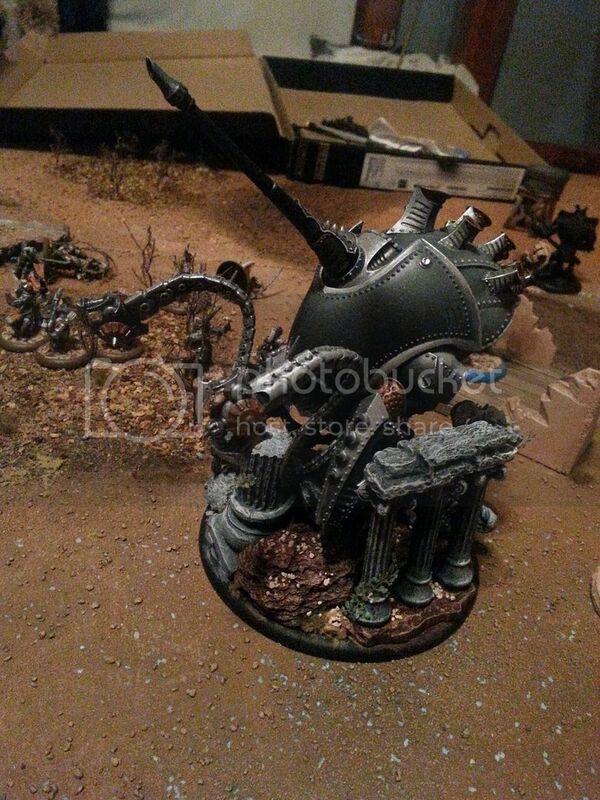 Our newest Cryx player is expanding his army in leaps in bounds. A constant theme in his lists is his Kracken. He had the based version of it at the latest tournament, but I got the last touches of paint on it yesterday morning and turned it over to him. Was interesting to get back into Warjacks a little bit after a year of organics. 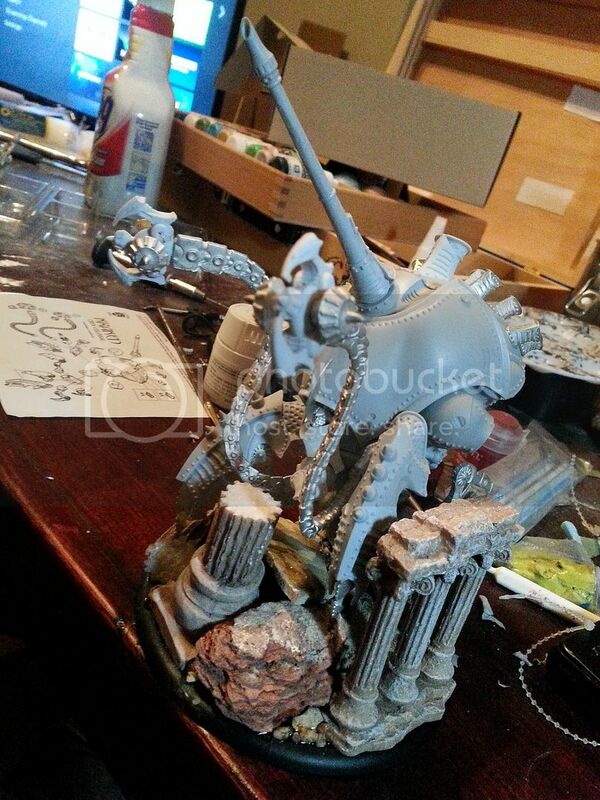 The airbrush makes it considerably simpler, and it was a godsend for the OSL. The guy wanted it based more excessively than normal. He originally wanted it tearing through a boat, but couldn't find one of a suitable size. So he ended up handing it to me with some aquarium terrain he found. I did the base seperate from the Kraken, but about the same level, trying to pose them together. 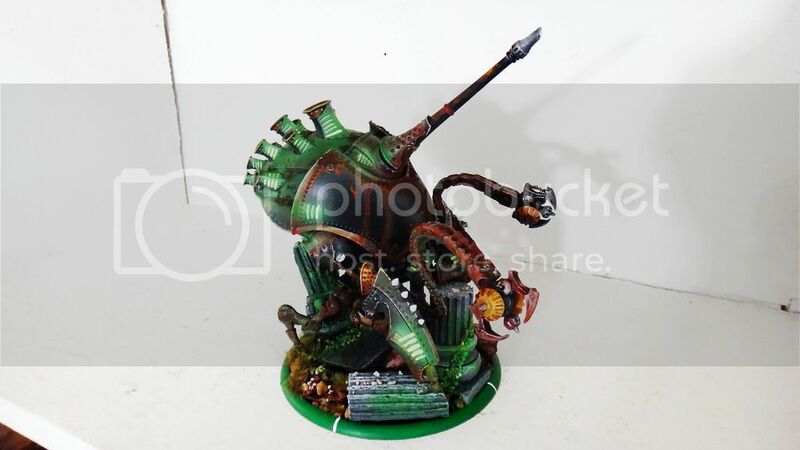 I ended up spiking a back leg on the kraken up pretty high to land on a column once I got the base completely made, and then I painted the base before moving to the Kracken. I had to glue it together and basecoat the whole thing briefly for a Masters tournament, but otherwise they've been two seperate pieces. The pillars kinda took me in a ruined greek temple direction, so that's the pallete I stuck with for the most part. I did the basecoat on the Kracken with the airbrush then went into detail work with a brush. 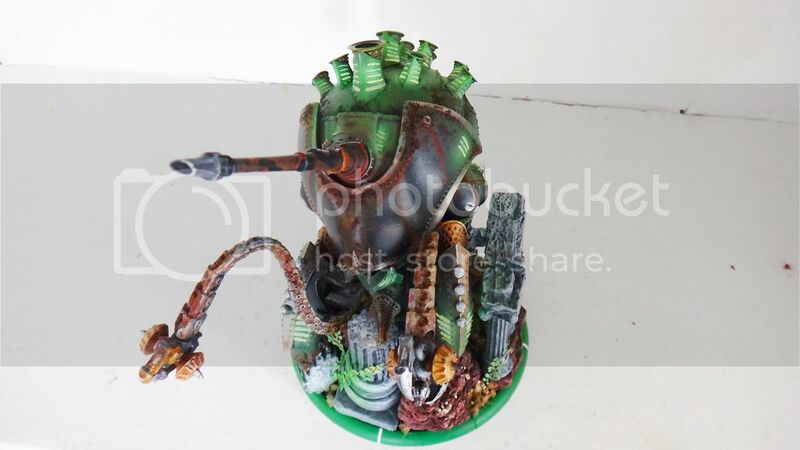 The client wanted a rugged, used looking kracken, so I set into the rust. I tried to make a solid orange wash, but ended up with a nasty looking yellow, and a mars red when I tried both times. This actually worked better. I essentially pretended to be a watercolor painter and left deep red in some spots and yellow in others, then mixing and blending as I went. It gave a really good natural random look to it. Very inconsistent. Then I dabbed watered-down elmers in spots and sprinkled secret weapons pigments on it. Then I sealed the model. Only thing left was OSL. I did forest green first, mixed it with a lime green, then went to the lime green, narrowing my focus each time with the airbrush. 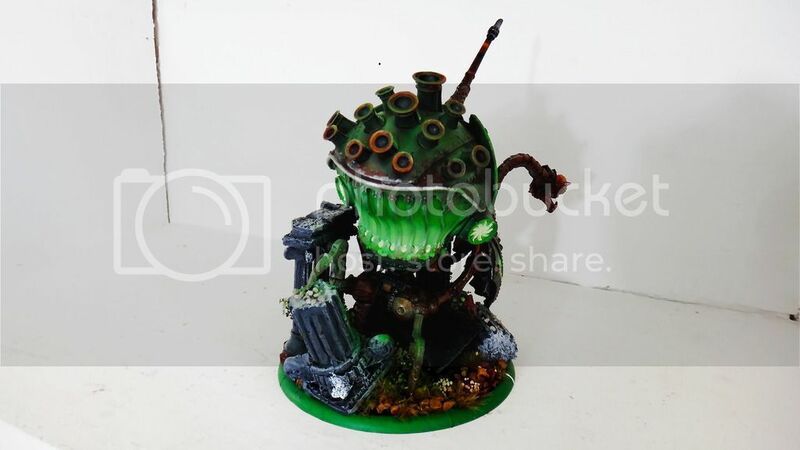 As I moved through the levels, I would place the Kracken on the base and see where the light would reach on the base and airbrushed forest green into those spots. The final step before glueing the whole thing together finally was to create a near-white thick wash from white and lime green, and flow it into the vents at the center of the OSL. The final effect is what we have here. So there you have it. I'm a commission painter on the side now it seems. I'm excited to see what else comes down the road from this player. 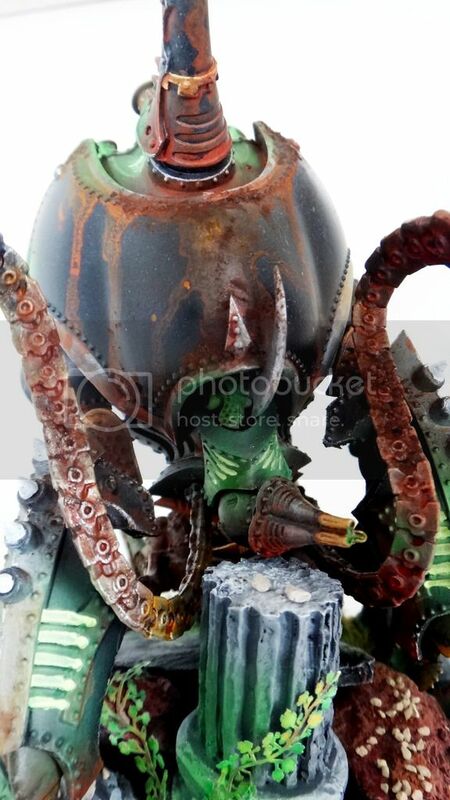 There's some really awesome Cryx models out there I wouldn't mind seeing on my table for a painting session. 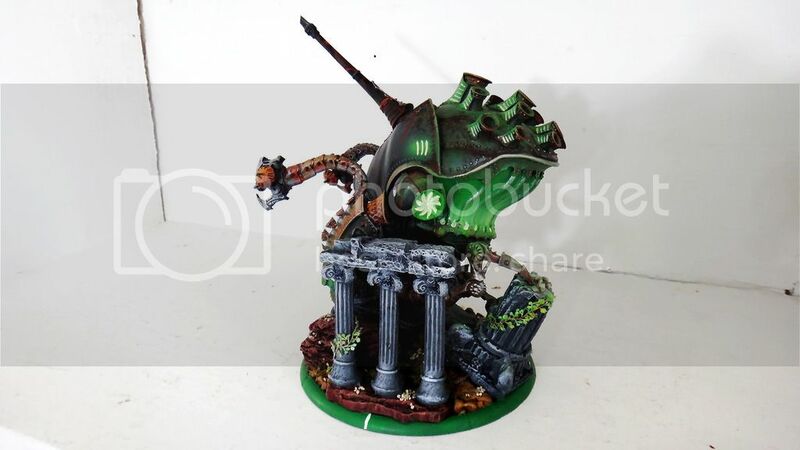 I just need him to get into Khador so I can paint Ruin too. I have two Batreps en-route very shortly, both against Gators. Our normal Cryx/Circle player that thrashes me on a regular basis recently got into Gators with the release of Jaga and the Vault, and both games have a Vault in them. Until then.